A love of textiles and a taste for travel sparked two great passions in the life of indigo dyer Jenny Balfour-Paul. Jenny and Glencairn relax on indigo-painted furniture. Travel has changed Jenny Balfour-Paul's life. She met her future husband, Glencairn, in the Middle East, and she fell in love with indigo. Both these passions are the mainstay of Jenny's life and she acknowledges it would be impossible for her to have to choose between them. The couple share a listed, cob-walled, thatched farmhouse in the West Country with their daughter Finella 21; and son Hamish, 20, as well as a vast array of new and old ethnic treasures. It is a house of colour and texture - a testament to their worldwide travels and Jenny's love of hand-dyed textiles. Now a world authority and author on indigo, as well as a textile artist, Jenny has a unique collection of indigo-dyed fabrics, garments, rugs, tools and lengths of cloth representing indigo-dyeing techniques from around the world. Rich shades of blue in beautiful tie-dye effects. Since university Jenny has spent time living in the Middle East and North Africa and has travelled extensively, collecting samples and artefacts, taking photographs, and recording dyeing methods. Her first love was batik, but that naturally led on to dyed textiles in general. 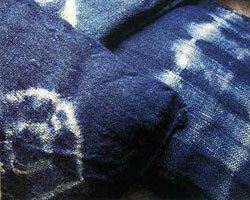 In the 1980s, she met and became the assistant of well-known dyer Susan Bosence. When the fabric strips are lifted from the vat of greeny-brown liquid, they change colour to blue as they come in contact with the air. "You can always tell indigo dyers by their blue fingernails," Jenny says. "You start off wearing rubber gloves and then get excited and take them of ." Jenny is sitting on the floor of the upstairs living room, which the family call the "diwan" - the name of the central room in Arab houses where people meet and talk. The floor is covered in vegetable-dyed kilims and rugs in autumnal colours, and a huge xylophone from Mali has pride of place. Masses of cushions are piled invitingly into a corner, each one block printed by Jenny with patterns inspired by Yemeni architecture. Jenny brings carefully folded pieces out of a trunk, each divided by layers of acid free tissue paper.